Outdoor Living-Design Ideas for Every Backyard - Design Connection, Inc.
Spring has officially sprung in Kansas City. Finally! Now that you’ve spruced up your home’s decor with these Spring-inspired accessories, it’s time to relax, unwind and enjoy this beautiful weather. At Design Connection, Inc., we’ve got some great ideas on how to carry the comforts of your home outside and transform your backyard into an outdoor living space, easily and affordably. Increase the square footage of your home by turning your covered porch into an outdoor room with retractable motorized screens. With the visibility of normal screens, this unique mesh allows the breeze to flow through your space while blocking 90% of UV rays. Safely behind these screens, you can say goodbye to citronella candles and play outside after the street lights come on without fear of getting eaten alive by mosquitoes. If you don’t have a covered patio, you can still reduce your home’s cooling costs and diminish fading of your interior furnishings with a motorized retractable awning. Filter light while maintaining your view like this Downtown Kansas City balcony turned summer retreat. Your outdoor space can be comfortably utilized in the middle of the summer with a little help from Awnings By Haas. Seating is a must-have for achieving a comfortable outdoor space. Unique pieces that reflect your personal style may be hard to come by at your neighborhood department store. As an interior designer for Greater Kansas City, I often come across beautiful pieces that I haven’t spotted here in town, like the convertible furniture set pictured below. Inspired by the petals of a deconstructed flower, this modular set of sofas, coffee tables and footstools from B-alance is a perfect example of furniture that will adjust to your needs. Hammocks will never go out of style. Ever. Being suspended from a tree in your own personal cocoon, swaying with the breeze in the shade is the ultimate form of outdoor relaxation. But have you ever tried sharing a hammock with someone else? Didn’t work out so well, did it? 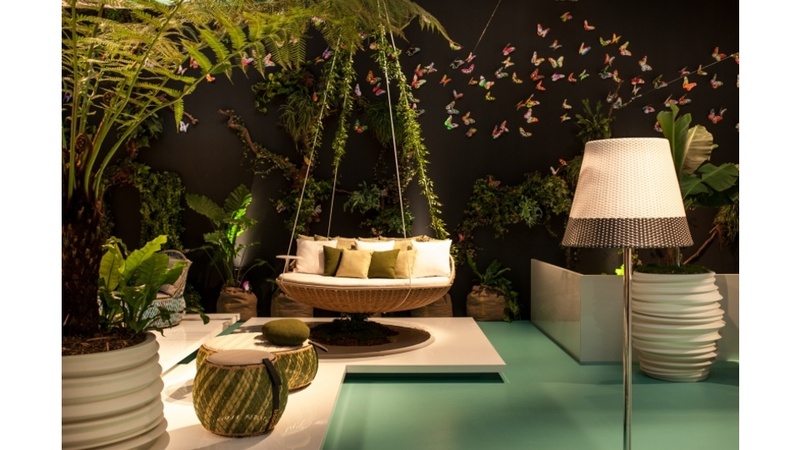 Dedon has combined the size and comfort of a bed with the relaxing elements of a hammock; and thus, The Swingrest was born. A great way to bring instant relaxation to your outdoor space is with a water feature. The sound of flowing water is well-known for producing a calming effect; sitting near a bubbling fountain is a great way to decompress and de-stress after a trying day or a long week. Water features can be easily incorporated into your design, both indoors and out. A wall mounted water feature, also know as a water wall, is a great option if floor space is an issue. Another natural element you can add to your existing outdoor space is fire. Recently, we talked about how affordable custom made furniture can be. Outdoor fire pits are no exception. You can personally select just about every material and feature when it comes to designing your own outdoor fire source. Design Connection, Inc. is here every week; sharing new design tips, ideas, unique furniture pieces and accessories. Stay updated with the latest trends in home design and decor by connecting with Design Connection, Inc. on Pinterest, Facebook, Google+, Houzz, Twitter and LinkedIn. Design Connection is an award-winning Kansas City interior design firm. We offer complimentary in-studio interior design consultations and can help you with your interior design, remodeling, revamping and restyling projects big and small throughout the Kansas City metro. What are you waiting for? Give us a call at 913-210-0511 or fill out our contact form and let’s get started on your interior design project today!